Salvation And Survival: Now THIS Is Profitable For Teaching! Now THIS Is Profitable For Teaching! Every once in awhile there is a bright spot in our culture; a moment that lets us know that God's remnant is still living and active in speaking Him into the world. And, occasionally, that voice comes from the heart of a generally godless segment of our society -- and it is like rain falling on parched ground. 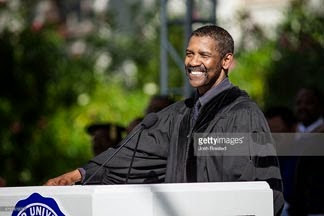 Such was the case when Academy-Award winning actor Denzel Washington gave the commencement address to the graduates of Dillard University, a private, historically black liberal arts college in New Orleans. He promised a short speech, with three very simple recommendations. His first words of advice were succinct and to the point: "Number one," he said slowly and resolutely. "Put. God. First!" No better counsel was ever given to a college graduate. Advice Number Two: Washington encouraged the students to take chances: "fail big and dream big". He continued: "Dreams without goals are just dreams, and if one doesn't have goals, then those dreams just ultimately fuel disappointment. In order to achieve these goals, you must apply discipline and consistency. Working hard is what successful people do." "In this text, tweet, twerk world you've grown up in, remember this ... just because you're doing a lot more (and here he imitated the motions of furious texting), it doesn't mean you're getting a lot more done. Don't confuse movement with progress." He cautioned that it is a big world out there; a mean world, and it can be scary. But they should pursue what they are passionate about. "Don't be afraid to go outside the box, or think outside the box... and continue to strive for your goals." Advice Number Three: "You'll never see a U-Haul behind a hearse. You can't take it with you... and it's not how much you have. It's what you do with what you have. We all have different gifts that we can utilize to achieve success. But the most selfish thing in this world you can do is help someone else. Why is that selfish? Because of the gratification and goodness that comes to you ... there's nothing better than that. That's where the joy is! That's where the success is!" At the end of their lives, it's how they lived that counts, not what things they amassed. As he concluded his short speech (only 10 minutes long), he closed with this advice: “I pray that you put your slippers way under your bed tonight, so that when you wake up in the morning you have to get on your knees to reach them ... And while you’re down there, say thank you. Thank you for grace, thank you for mercy, thank you for understanding, thank you for wisdom, thank you for parents, thank you for love, thank you for kindness, thank you for humility, thank you for peace, thank you for prosperity. Say thank you in advance for what’s already yours. True desire in the heart for anything good is God’s proof to you, sent beforehand, to indicate that it’s yours already." He repeated that last statement to get across his point ... whatever itch or desire they had to do something good was God's proof that He had put it in their heart, and it was their's to claim. He further admonished them to work hard to get it, and "when you get it, reach back and pull someone else up ... each one, teach one." Wow! This man gets it! He just combined several Scriptural passages of hope all into one simple address ... and finished it up with the advice to say, "Thank You!" In his wise words, we hear familiar teachings from the Bible ... God knows the plans He has for your future, and the hope He wants to give you; if you trust in the Lord with all your heart, He will direct your path; those who love God will find that all things work together for good and God's purpose [which He knows beforehand]; Wait for the Lord; be strong, and let your heart take courage; Commit your work to the Lord, and your plans will be established. With a simple testimony of the role God has played in his life, and the admonition to be grateful for the gifts they've received, Denzel Washington managed to give those graduating seniors a recipe for success. “Don’t just aspire to make a living,” he concluded -- emphasizing each word with emotion -- “aspire to make a difference.” If they follow that advice, they will be prosperous in the things that matter in this world, while at the same time, storing up great treasures in heaven. I can't think of any better words of wisdom for this generation. Deuteronomy 32:2-3 "My message shall drop as the rain, my speech shall distil as the dew, as the light rain upon the tender grass, and as the showers upon the herb. For I will proclaim the name [and presence] of the Lord. Concede and ascribe greatness to our God." What a contrast Denzel Washington's commencement address was to Michelle Obama's. Denzel focused on God and his goodness, while Mrs. Obama's speech focused on the poor treatment she has supposedly endured as a black woman and even in her role of First Lady. [Dare I mention that she had her husband, the President, have taken advantage of their positions these past 7 years to be treated like royalty?] .Denzel's message was one of thankfulness and hope. Thank you, Denzel!